Wiegmann N4 Series 1-Door enclosure features 14-gauge steel body and door construction with polyester powder-coated finish. It has continuously welded plasma seam for neat appeal. It measures 36-Inch x 48-Inch x 10-Inch. Rolled lip on all sides of enclosure opening excludes liquids and contaminants. It has easy-to-use stainless steel door clamps and hasp-and-staple for padlocking. Remove door by simply pulling stainless steel continuous hinge pin. Poured in place polyurethane gasket offers tight sealing at door ends for restring unwanted flow of liquid constraints. Collar studs of this enclosure allow mounting optional back panels. It includes external mounting feet for mounting enclosure. It is suitable for use in housing electrical and electronic controls, instruments, components and associated wiring. 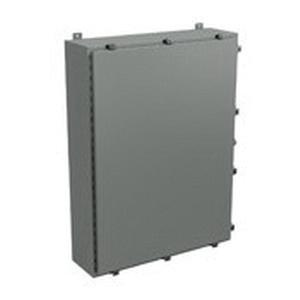 Enclosure is UL listed, CSA certified and meets NEMA/EEMAC standards.